Although I normally drink my coffee black with just a little sugar, around the holidays I find myself enticed by the holiday creamers in the dairy case. Peppermint mocha, pumpkin spice and gingerbread latte all just sound too good to pass up. Also, a little extra sweetness and flavor in my coffee just seems appropriate during the holidays. However, as I am pregnant this year, I found myself wondering just what was in these delightful flavored concoctions and a look at the ingredient list was not encouraging. After palm oil and sugar (the first two ingredients) I did not recognize any of the other ingredients. 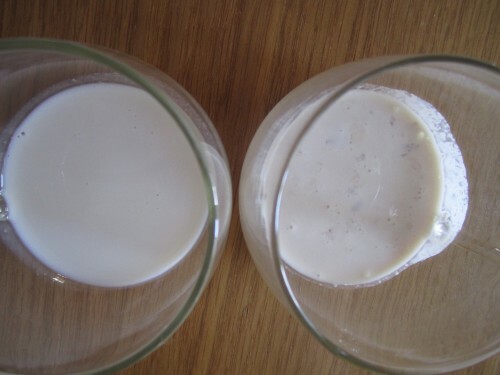 I wondered about making a flavored creamer at home and my husband pointed out a post an deliciouslyorganic.net that had several recipes for homemade flavored creamers. There are lots of yummy sounding combinations on the site, including most of the ones I listed above, but there was no recipe for my favorite holiday flavor: gingerbread latte. I decided to try out a combination of my own and see how it measured up to International Delights Gingerbread creamer. 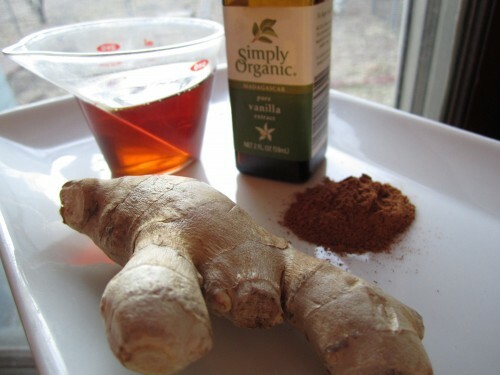 If Gingerbread isn’t your holiday creamer of choice, I encourage you to visit deliciouslyorganic.net . She has a wide range of flavors plus dairy-free and sugar-free versions. 1. In a small saucepan, whisk together the cream, milk, ginger, cinnamon and maple syrup. Heat over medium heat, whisking constantly, until the milk just begins to steam. Remove from heat and whisk in the vanilla. Pour the mixture through a fine-mesh strainer into a clean, airtight container. Refrigerate until cooled. Keeps in the refrigerator for about 10 days. I would like to first note that the homemade creamer will not be completely white and smooth in appearance. It could be made a little smoother by using whole cinnamon sticks in place of the ground cinnamon, but whole cinnamon would not give the creamer as much flavor so I chose to use ground. 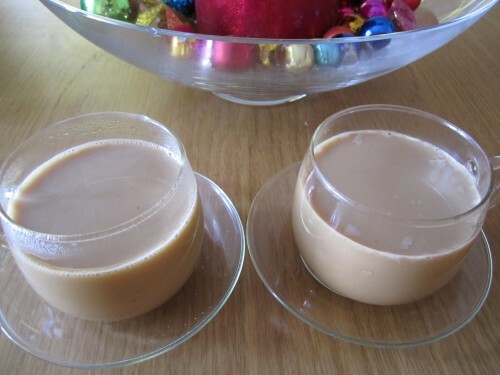 The homemade creamer was quite a bit thicker and richer looking than the store bought variety and left little white swirls of cream on the top of the coffee. To judge the flavor of the creamers, we first tasted a little bit of each plain and then added about 1 tablespoon of each creamer to cups of coffee. I was surprised at how different the two creamers tasted. The homemade creamer was much less sweet than the International Delights creamer, but it had a stronger gingery-cinnamon flavor that was very appealing. When added to coffee the homemade creamer lent just a touch of sweetness but lots of spicy flavor. In contrast, the store bought creamer was very, very sweet and the sugary sweetness seemed to drown out any of the spice flavor. Also, we noticed a distinct, strange aftertaste that lingered after drinking the store bought creamer while the homemade creamer left no aftertaste at all. As far as price is concerned, the two creamers were very close. A big 4 cup container of International Delights Creamer (the only size we could find!) cost $2.99 while 2 cups of homemade creamer cost $1.25. Of course, we usually end up having to buy much more store bought creamer than we will use since they often only come in large jugs. One can make just as much homemade creamer as needed, offering a possible means of saving money. Bottom Line: Homemade creamer is richer tasting than store bought with lots of flavor and less overwhelming sweetness. It also cost slightly less than store bought and has the advantage of being customizable to each person’s tastes. I will definitely be making homemade creamers from now on.